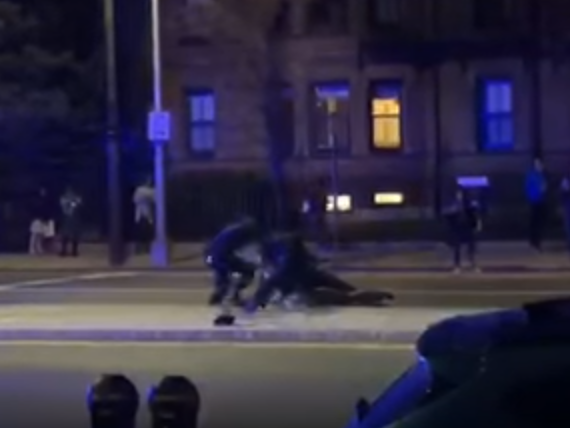 Video Shows Police Tackling, Punching Black Harvard Student : The Two-Way Police in Cambridge, Mass., had responded to calls of a naked man in the street. "Cambridge affirms that Black Lives Matter, but it must be true in practice as well," the city's mayor said. Bystander video captured an incident in which police in Cambridge, Mass., are seen punching a black Harvard student who was naked in the median. Police in Cambridge, Mass., tackled and punched a black Harvard student who was standing naked on a traffic island on Friday night. The incident was captured on video by witnesses, and the city's mayor called the video "disturbing." Officers responded to a call from a woman who said a man had thrown his clothes in her face. Police say they received approximately six other calls about a naked man, and a police report stated that women who "appeared to be acquaintances" of the man told officers that he had possibly taken a hallucinogenic drug. The video shows the man, who police identified as 21-year-old Selorm Ohene, standing in the middle of a traffic median, surrounded by officers. Ohene takes steps toward one of the officers and then is tackled from behind by another. Ohene and the two officers fall to the ground, and more officers step in to help subdue Ohene, who is heard shrieking. Ohene is punched multiple times. Bystanders stopped to watch from sidewalks and are heard criticizing the officers' response. "Every attempt that was made to calm Ohene down and reason with him was met with opposition. We informed him that we were only there to help him and were concerned for his safety. It was made very clear that our pleads were not going to be received by Ohene. Ohene's behavior became aggressive, unreceptive, and intimidating almost immediately. Ohene's hostility rapidly escalated. As Ohene and I conversed, I observed him clinch both his fists. Ohene started to take steps towards officers in a an aggressive manner. I perceived this as a threat and thought an attack was imminent. Ohene's goal was to seriously hurt himself or one of the officers on scene. It was clear, Ohene absolutely could not be reasoned with. Ohene's behavior could only be summed up as chaotic and tumultuous. Ohene then turned from me and started walking in the direction of Officer Maziarz. At that point, I made a tactical decision to grab his legs and bring him down to the ground. This maneuver was effective in getting Ohene to the ground but Ohene continued to resist us with all of his strength. "We gave Ohene verbal commands to give us his hands which he did not. Unable to pry Ohene's hands from underneath his body, I delivered approximately 5 strikes with a closed fists to the area of his stomach. These seemed ineffective. Eventually Officer Maziarz was able get control of Ohene's right arm and place it behind his back where it was placed in a handcuff by Officer Harney." "A naked, unarmed Black man, stood still on the median at the center of Massachusetts Avenue across from Harvard-Epworth United Methodist Church. He was surrounded by at least four Cambridge Police Department (CPD) officers who, without provocation, lunged at him, tackled him and pinned him to the ground. While on the ground, at least one officer repeatedly punched the student in his torso as he screamed for help. The officers held him to the ground until paramedics arrived, placed him on a stretcher, and put him in the ambulance. A pool of blood remained on the pavement as the ambulance departed." "What is shown on the video is disturbing. We have high standards for our police officers in Cambridge. In most cases, the extensive training our officers go through results in the de-escalation of dangerous situations. When confrontations cannot be averted and include the use of physical force, we must be willing to review our actions to ensure that our police officers are providing the highest level of safety for all. "Cambridge affirms that Black Lives Matter, but it must be true in practice as well. Policing in Cambridge is far ahead of many communities across the country, and yet we can always strive to do better. As Mayor, I will continue working with my colleagues to make sure that the horrific treatment of black Americans at the hands of law enforcement has no place in Cambridge." Cambridge Police Commissioner Branville Bard said in a joint statement from city officials that use of force was required in order to make the arrest, and that officers used their discretion to "prevent the altercation from extending and leading to further injuries." Police have charged Ohene with disorderly conduct, indecent exposure, resisting arrest, assault, and assault and battery on ambulance personnel. According to city officials, Ohene spit a mixture of blood and saliva at an EMT; two police officers were treated at a local hospital for minor injuries and exposure to bodily fluids. The incident is under internal review by the Cambridge Police, as is its policy when force is used. The department's Use of Force policy dates from 2011 and delineates the situations in which force can be used. The policy dictates that officers may use only the level of force "necessary to overcome any resistance or force being used by the perpetrator."